We love the large bath tubs located in the bedrooms themselves – an invitation to romance if ever we’ve seen one! 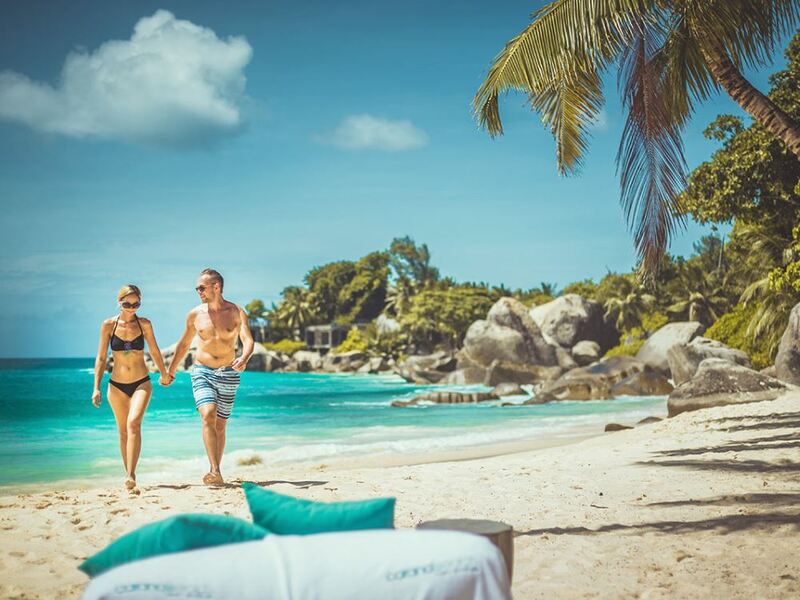 Of all the resorts on Praslin that we saw, perhaps the most luxurious and classy of all of them was the Black Parrot Suites – a wonderfully positioned collection of just 12 suites perched spectacularly on a rocky headland overlooking a bay peppered with picturesque sandy coves in the south-eastern corner of the island. The Black Parrot Suites actually form part of the Coco de Mer hotel – “a resort within a resort” is perhaps the best way to describe it as the Black Parrot Suites lie about 100m away from the main hotel and entry is exclusively reserved to guests staying there. 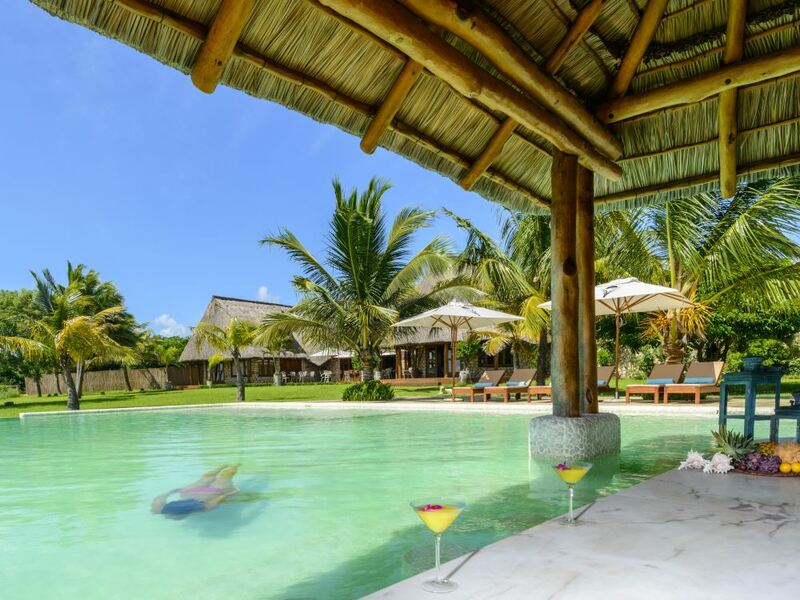 It also boasts its own swimming pool and bar area, so guests staying here could easily hole up here for most of the day, emerging only at meal times which are housed in the Coco de Mer’s main restaurant. And with the Black Parrot Suites only accepting guests over the age of 14, it’s ideally suited for honeymooners and other romantics wanting to chill in an atmosphere of peace and tranquility. It’s certainly a very inviting place to do just that. The rooms are spacious and extremely elegant in their shades of marine greens and beige. 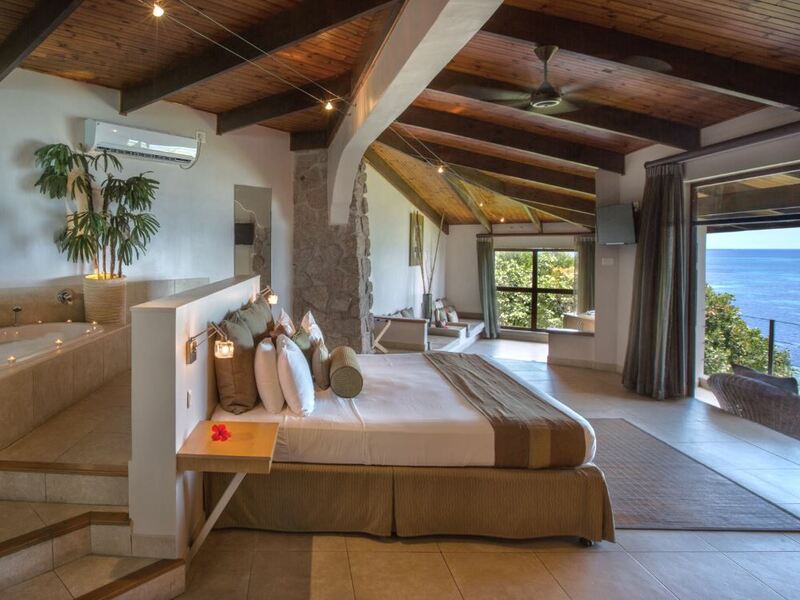 Whilst each of the suites differ slightly in shape and layout, all of them have a separate lounge area on the lower split level leading in turn out to a private veranda deck looking out over the azure waters and sandy coves of the bay below. A lovely feature of the bedrooms are the large baths positioned behind the low wall that serves as the headrest to the huge king size bed, so you can have a luxurious soak by candlelight whilst chatting to your partner. Add in the very appealing bathrooms with huge walk-in showers and twin vanities and these suites really are very attractive places in which to enjoy a blissful week’s break! The area outside the suites isn’t too shabby either! The Black Parrot Suites area has its own exclusive use swimming pool which enjoys spectacular views to the ocean and beaches below. There’re also very comfy seats perfect for sprawling in with a good book whilst enjoying a cold cocktail from the nearby bar. 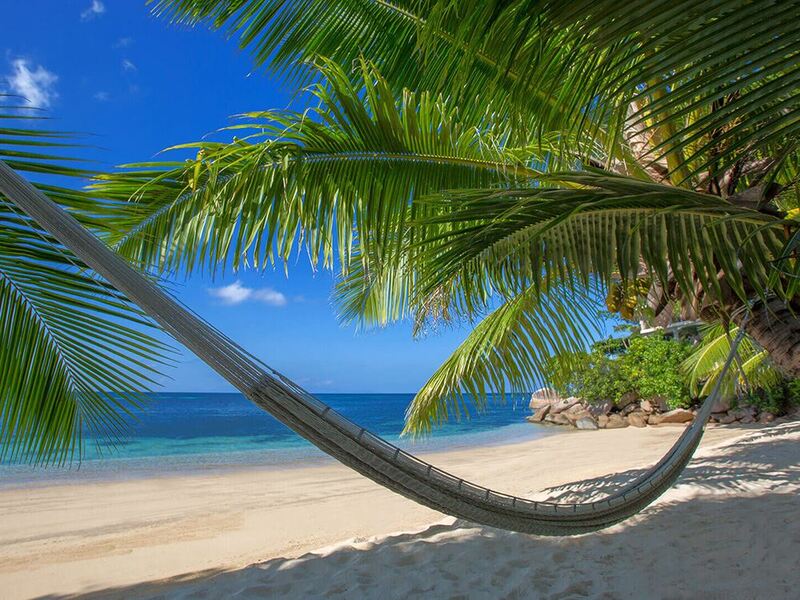 If you prefer laying out your towel on beach sand and swimming in the ocean, a short stroll down the hill brings you to an attractive little palm tree lined cove where you can spend many relaxed hours. There’s even decent snorkeling with plenty of fish to be seen around the rocky headlands and the jetty. Please be aware that from around May to October the prevailing south- east winds mean that seaweed does wash onto the beaches of the southern coast of Praslin – the staff here work tirelessly to keep at least one of the resort’s beaches swept clean during this time, but the resort does also supply free transfers to the absolutely gorgeous Anse Lazio beach in the north of the island which is unaffected during this time. Whilst entrance to the Black Parrot Suites is restricted to guests staying there, there is no restaurant onsite and guests instead have to take a short stroll down the hill to use the restaurants of the main Coco de Mer resort – on the plus side this does give you the chance to socialize with more people. Breakfast at the Hibiscus Restaurant is a lovely spread including everything from a wide range of fresh fruit to pancakes and the full spectrum of eggs. Dinners are mixed with set menus with a choice of courses on some nights alternating with themed buffets – feedback from guests regarding quality and quantity is consistently good. Our favourite place though has to be the light, airy and contemporary Mango Terrace Bar and Grill next to the swimming pool, where a selection of delicious light lunches ranging from burgers to toasted sandwiches and outstanding pasta is on offer. 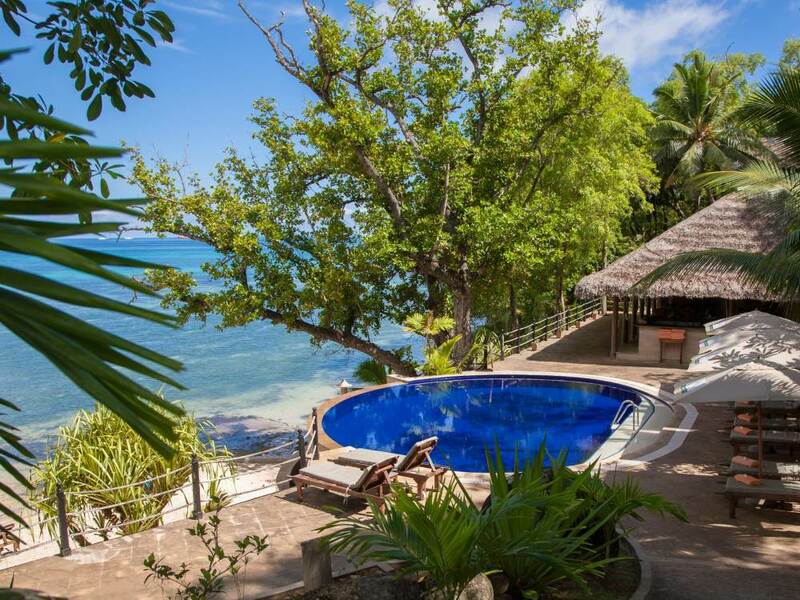 If you’re wanting the small island feeling but your pocket can’t stretch as far as the mega-priced “one island, one resort” lodges, then this small and luxurious hotel of 24 gorgeous villas a mere 15 minute boat ride from Mahe could be just the place for you!